Hi all, I am looking to do some bottom painting and i am too cheap to rent the "Lift" at the marina. The boat is on the trailer now and the areas that need painting the most is the area under the bunks. I got a plan in my head that should work but I have never been accused of being very smart so I thought I would bounce it off a couple of people on this list that I know to be smarter than the average bear. Assuming I can procure 4 stands I planned to lower the nose wheel of the trailer its full range thus putting the stearn in the air. Place a couple stands under the stearn and raise the nose wheel all the way place a couple more stands under the bow and then lower the nose wheel and viola I should have enought clearance to fit a paint brush. Sanding might be a little difficult though. If anyone has tried this or has aonther meathod .... I am alll ears. Not bad, depending on the form of the trailer, two stands in the back. tilled down, then using a 2 ton+ floor jack with a peice of wood bolted on the match the keel should work, remember to chain the rear jacks together and make sure they do not shink into the ground(like 2x12x2 wood peices/pads), also watch the angles you only need enought room to get the roller in(i.e do not till to much), 6 inches +clearance, you wnat to make sure the boat does not move during the seond lift and if something goes wrong the trailer will chace it, not get crushed by it, remember to pad the floorjack(heavy wood and cinderblocks). BTW do not leave the boat like this longer then you need, not great for it, like paint what you can, wait a day,, then lift for the area under the bucks/keel, let dry(1/2 day) and get is back on the trailer. Your idea works great. I built a stand that fits under the stern and supports the full width but two stands well placed will do the same thing. You may find it difficult to get under the bunk boards without removing them. If they need replaced or recovered now is a good time to do it. Working around the trailer and painting the bottom without painting the trailer as well is a major PITA but do-able. Good luck, we haven't had a dry day in two weeks. I can't imagine yours being any better. I use the jack stand method, and it works like a charm. It's safe, and easy. I use three jack stands: two with flat pads, one V shaped. The screws on the jack stands will lift the boat. Move the position of the handle on the screw of the jack stand every time you move the post. This will ensure the jack stand remains stable. It also allows you to reset the hydraulic jack. Put cinder blocks, bricks, and pieces of wood snugly under the keel after each lift. Around here, boats much larger than ours are left on three jack stands, sitting on their keels, for half the year. Personally, I'm much more comfortable once my boat is safely back on its trailer, but, at the same time, it's nice to know you can safely work under it whenever you need to. 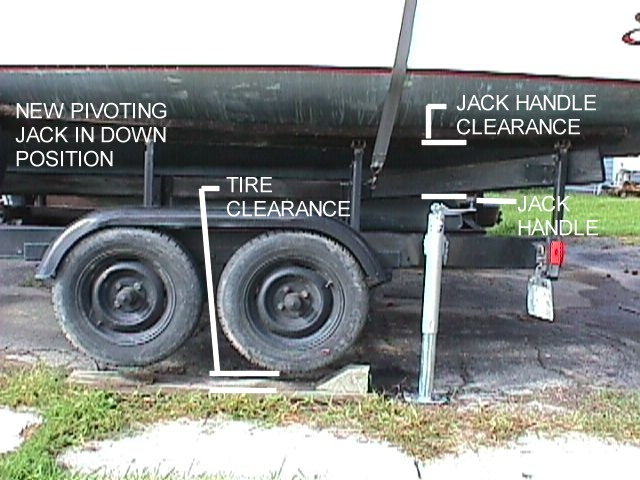 This jack stand method can also be used to position the boat exactly where you want it for trailering. The below enclosed article was originally posted to the Rhodes List back on 09/03/01. It discusses how to build my rear trailer jacks. This modification to your boat trailer will enable you to raise up the whole boat & trailer. 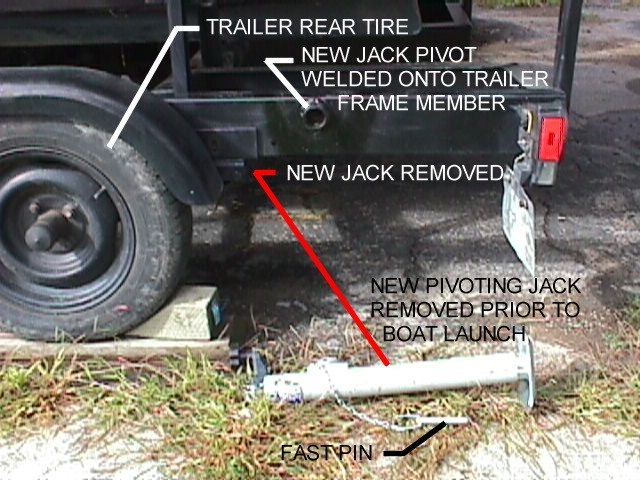 Then, if you put jack stands in place or blocked up the boat with cribbing, you could lower the trailer out from under the boat. No muss, no fuss. 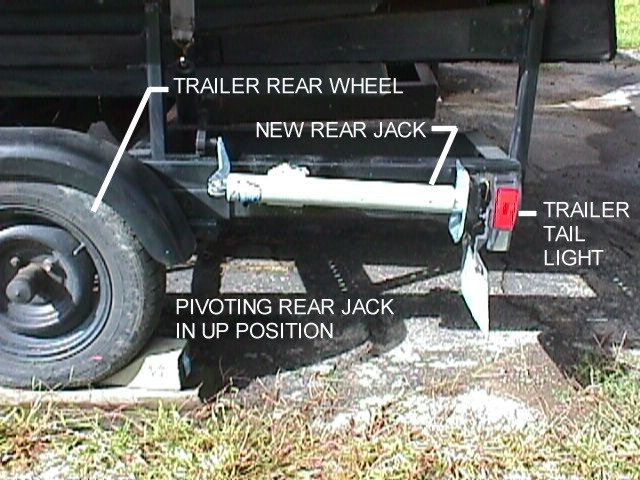 Read the article below & you'll find other uses for these rear trailer jacks. I really like them.